Our adult Choir rehearses Thursday nights at 7 p.m. in the choir room. Choir sings during the school year and takes a break over the summer. 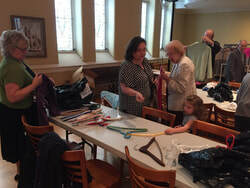 Join us the first Sunday of each month for an opportunity to participate in our Community Breakfast Ministry by joining together to sort/fold/hang clothes following our shortened faith formation class. The clothing will be given out a the monthly 1st Sunday dinners and 2nd Saturday breakfasts. Join us and support this great ministry. Union Lutheran Church in partnership with the York Rescue Mission is hosting a FREE 1st Sunday Community Dinner. ​The purpose of this dinner is to gather as neighbors and community members, to share a meal, share conversations, and grow together as a stronger community. We believe that each and every person is valuable in the eyes of God, and that together, God uses our gifts to better love God and better love and serve our neighbors. We host a community breakfast every 2nd and 5th Saturday between 8-10 a.m. in the Auditorium. Join us for a great breakfast, and a wonderful opportunity to get to know our neighbors.